Looking at the title one can immediately notice this is not a CPU, GPU, or motherboard. Though it may resemble a coffee maker just a bit, it certain isn’t! 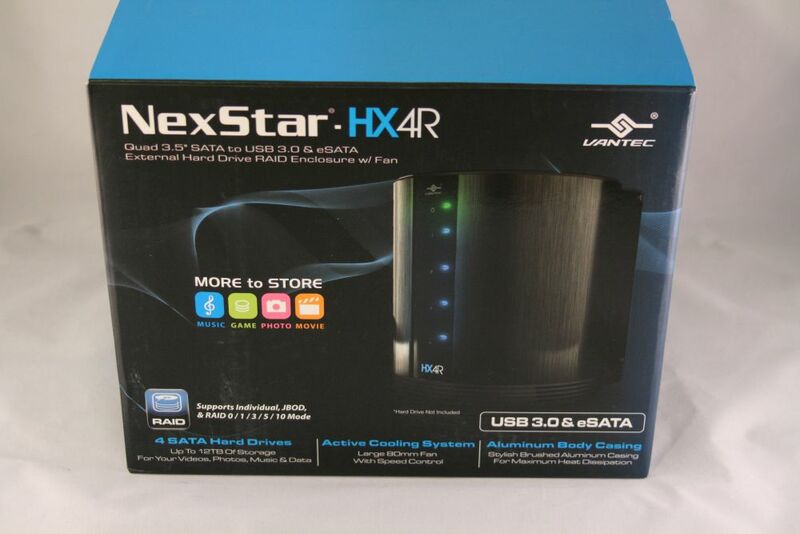 All joking aside we have an External HDD enclosure from Vantec, the NexStar HX4R, to look at today. 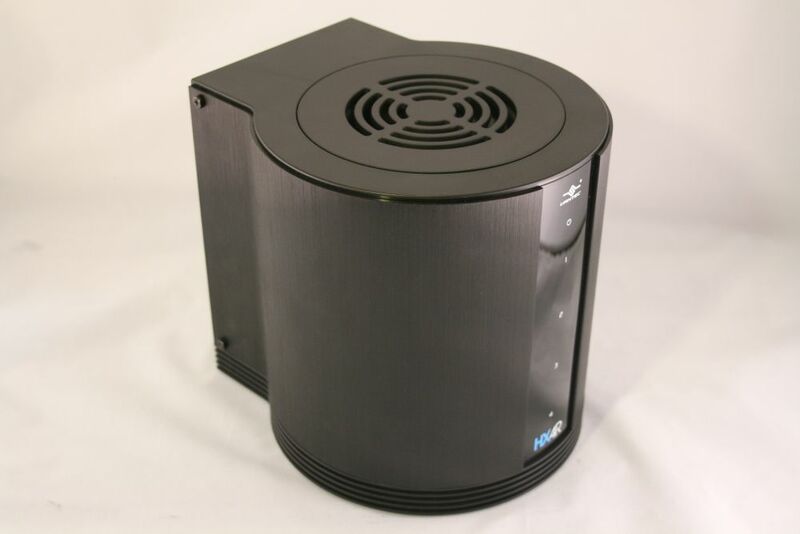 The enclosure offers several levels of RAID and the ability to hold up to four HDD’s and up to 16 TB of data. Let’s take a closer look! That out of the way, we will look at some of the specifications of the device, and move on to the features. It’s an enclosure, so not too much to see here really. 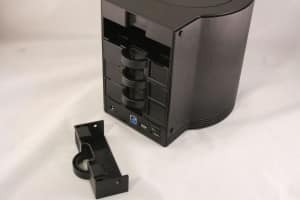 Just note a few things that it supports SATA1/2/3 HDDs (3.5″), and its connected to your system via USB3 or eSATA connectivity. Last up it can hold up to 16 TB of drives (4×4 TB). 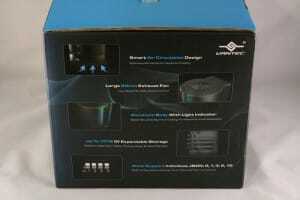 As is usual with other components you are used to seeing reviewed, we will take a look at the retail packaging first. 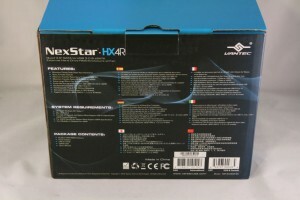 The front of the box shows a picture of the unit itself, its connectivity (USB3 or eSATA) and suggested things to put on it (music/videos/pictures, etc.) as well as a few specifications such as how many drives/data it can hold and its active cooling system, a 80 mm fan. 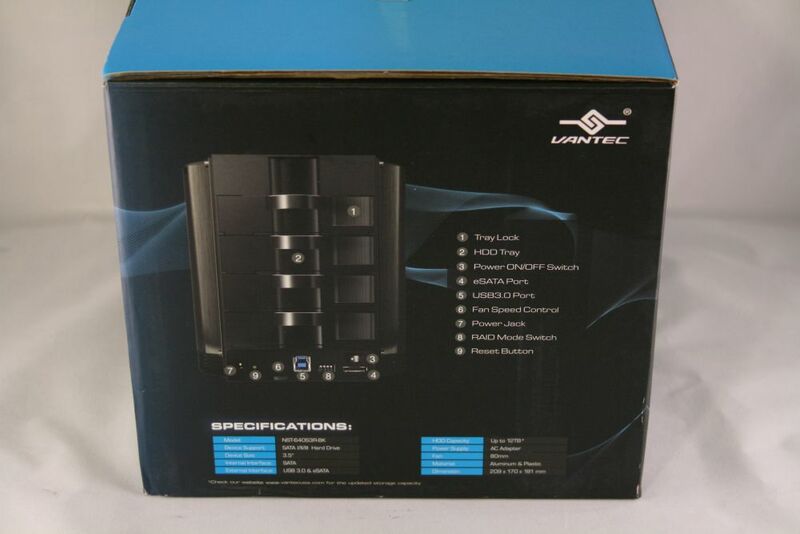 Taking a look at the rear you see more features like the air circulation design, bottom to top going across all the drives (nice thinking there Vantec! 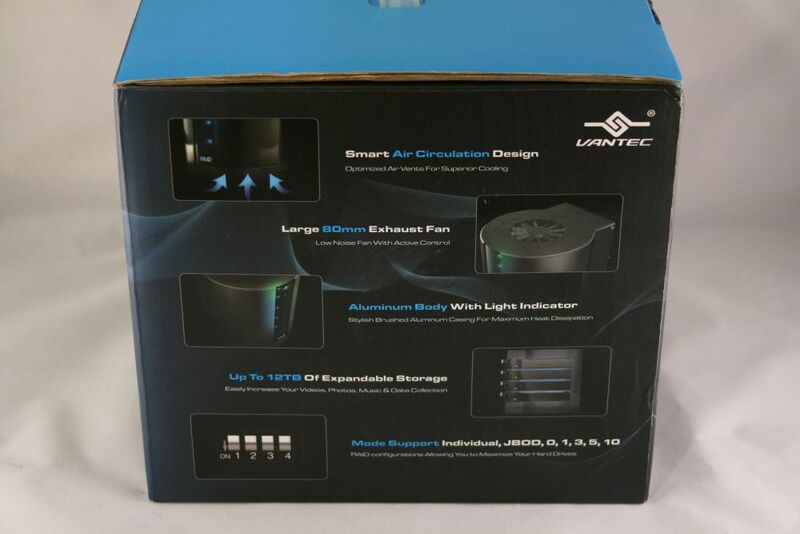 ), the aluminum body which they state helps dissipate some of the heat inside as well. 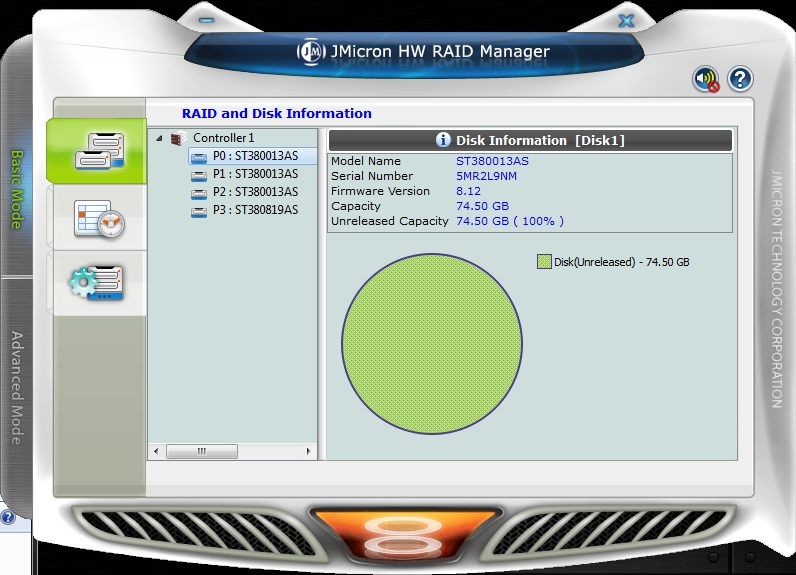 It also mentions the amount of storage it can handle. 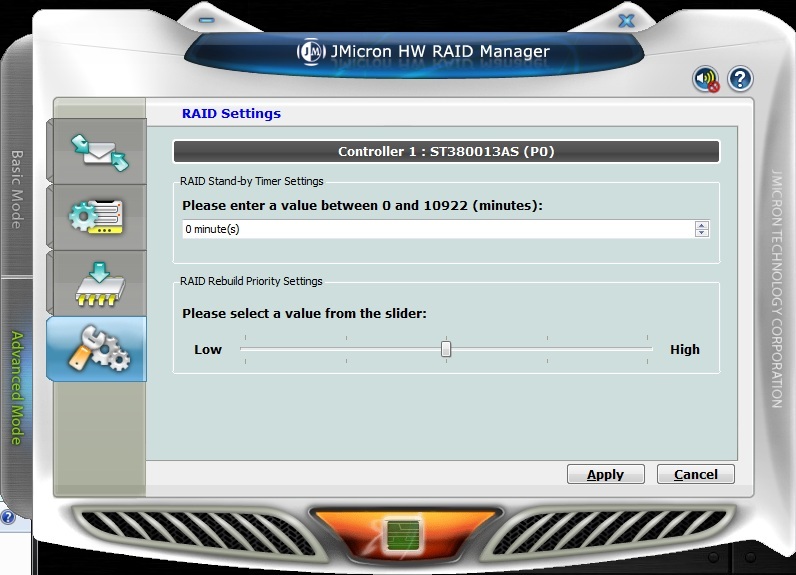 Another side has more features and specs and in different languages. The last side shows the rear of the enclosure and some of the features it has. 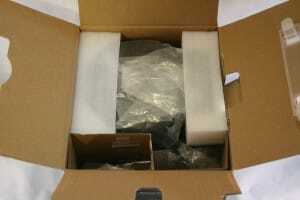 Inside the box we can see the unit is well packed siting in its bed of form fitting Styrofoam. Ok, time to take her out and see what this unit is all about. At first glance, one may want to drop a single serve coffee pack in the top and get some caffeine out of it, but we know its not a coffee maker. Please don’t misconstrue that as a negative. The HX4R, in my opinion, is a quite attractive unit clad in its brushed aluminum shell with a green power LED on top and a blue LED for each drive when one is physically installed. Its plain to see the 80 mm cooling vent up top, and as noted earlier the fan beneath. The fan is a quiet little bugger on all speed settings (dial in the back, shown a bit later). 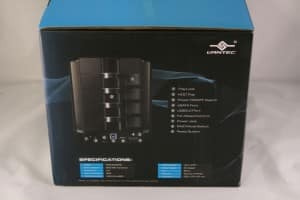 I couldn’t hear it over the three 120 mm fans in the case sitting below. So that is a good thing. 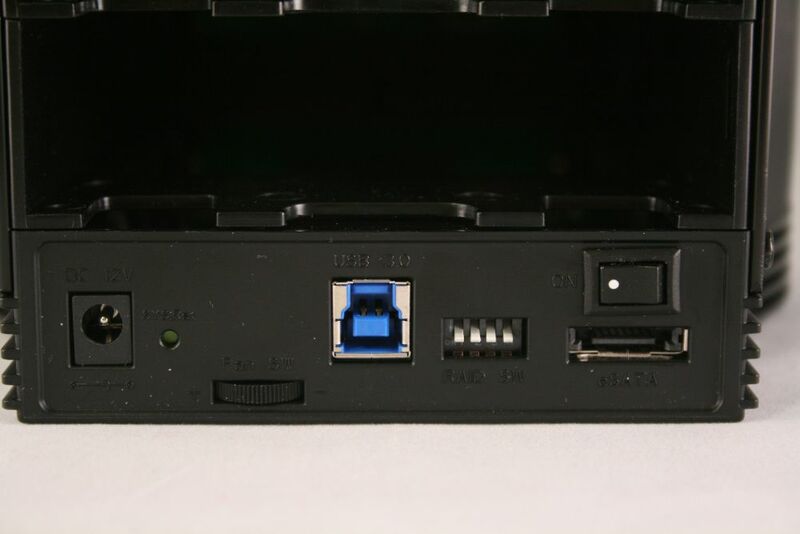 On the back side is where one would insert the drives and control a couple of functions. Looking at the HX4R a bit more granular, you can see the mounting hardware to hold a drive. 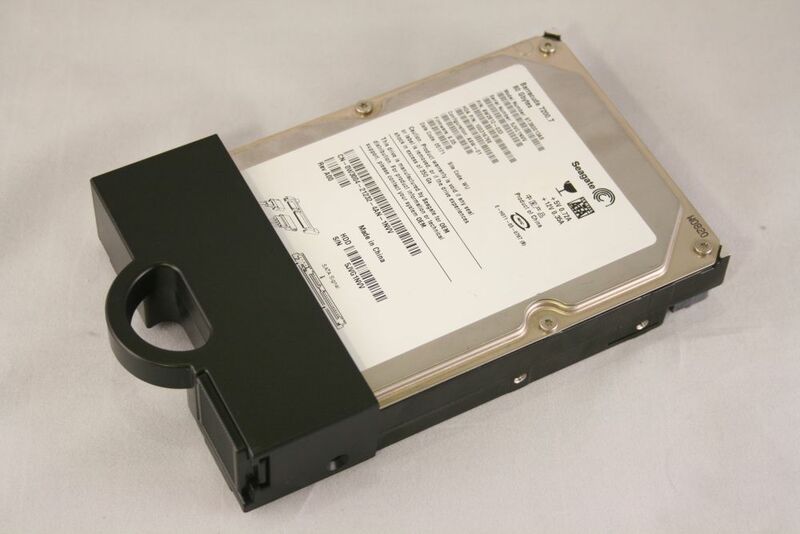 You need two screws to secure the hard drive, which in this sample, it did not come with it. I had read another review which stated the enclosure does include them, so, hopefully that is the case and this was just a packing snafu at the warehouse. 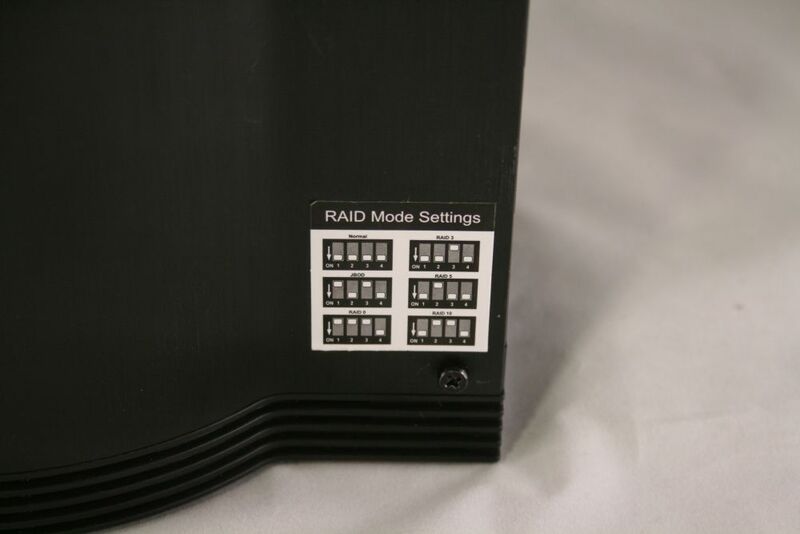 Taking a look at the rear I/O area we see, from left to right, the AC adapter plug, a reset button that resets the entire enclosure, the fan speed dial, USB3 port, the jumpers for setting up RAID (can do this with software as well), the power switch, and last the eSATA port. 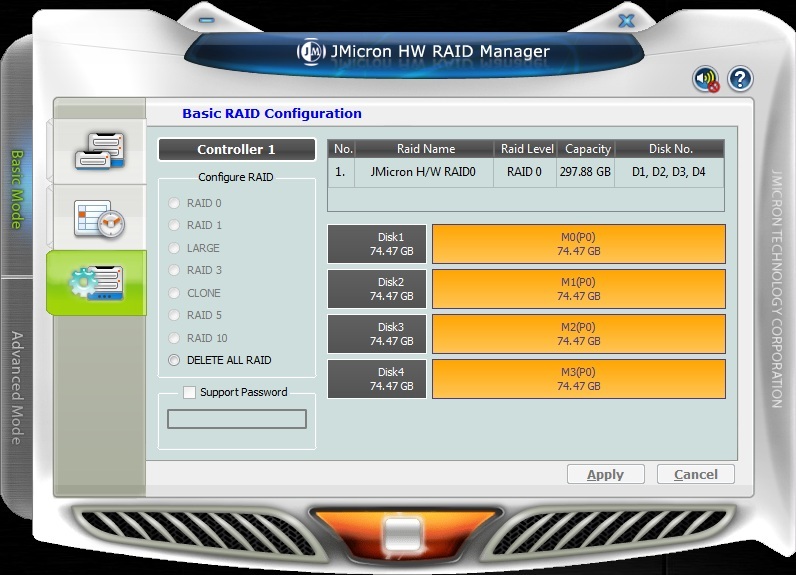 The next picture in this grouping shows the configuration for the jumpers for which RAID type you would like to use. 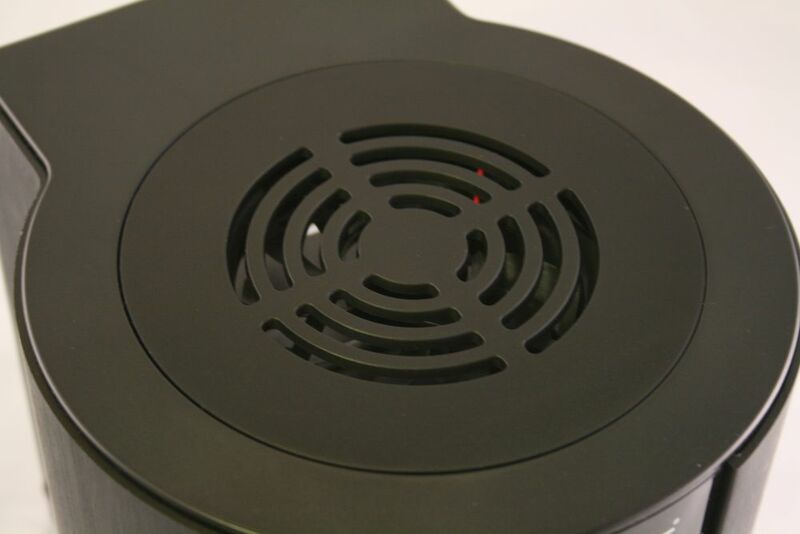 Last but not least, a closeup of the 80 mm fan. Vantec has included software, JMicron HW RAID Manager to help get you going on this device. It is very simple to use in both ‘basic’, and ‘advanced’ modes. 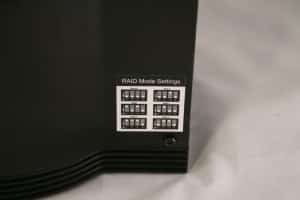 Basically you have your choice to select which RAID modes, none/JBOD/RAID0/RAID1/RAID3/RAID5/RAID10, and which disks to use in the array, press the button and GO! It takes around 10-30 seconds to build the array with the small, slow, drives I used, then voila… an array! Below are some thumbnails of other screens from this software. 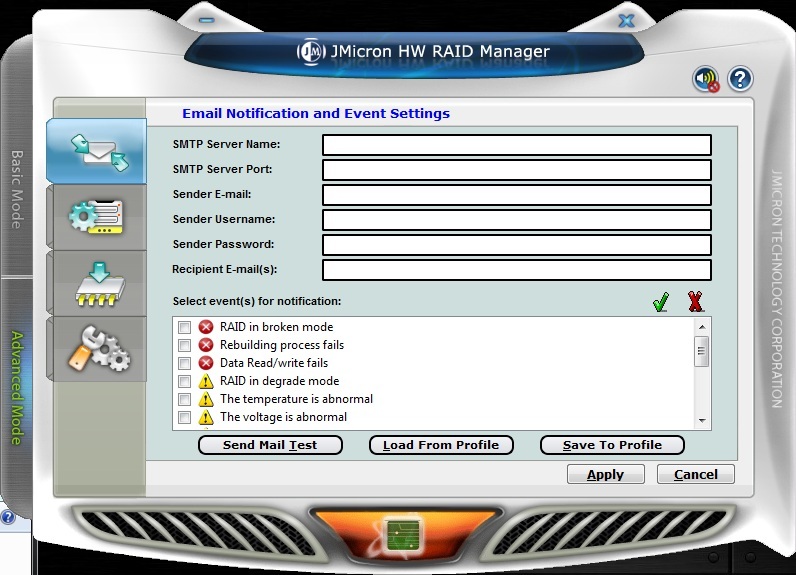 A couple of features I would like to mention that this software offers are email notification with a slew of thresholds/events to notify about. 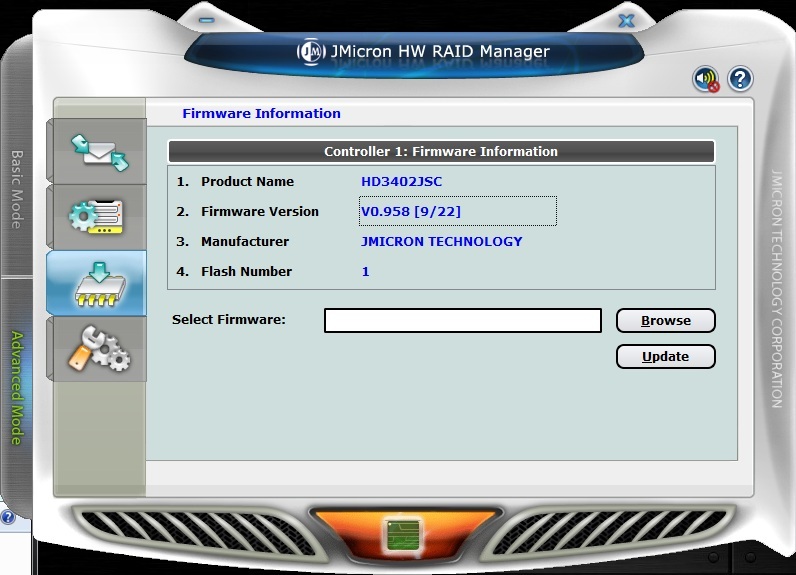 You can also update the firmware on the software in the advanced section. All in all, simple to use and effective in its uses. 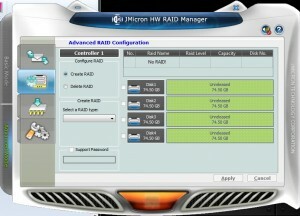 The second thumbnail shows a RAID0 array created. I chose the K.I.S.S method here as in this day and age of SSDs, I’m not sure anyone wants to see IO tests and things broken down as detailed as say ATTO/Crystal Disk Mark with its multiple file sizes (though we will for the SSD testing). This is for storage generally speaking so to be that granular just adds a level of ‘fluff’ to it that, in my opinion, can only serve to confuse. We never measured HDD performance on 4k files sizes like SSDs do, so why start now? To that end, I have chosen to use HDTune (latest) exclusively with the HDDs. Ok, so how does it perform? Let me first start off by saying that the only four drives I had available were some old Seagate 80 GB 7200.7 drives. We can safely assume by looking at the first two results below that these drives are not screamers compared to today’s modern drives pulling well over 100 MB/s. What happens when you strap four of them together? 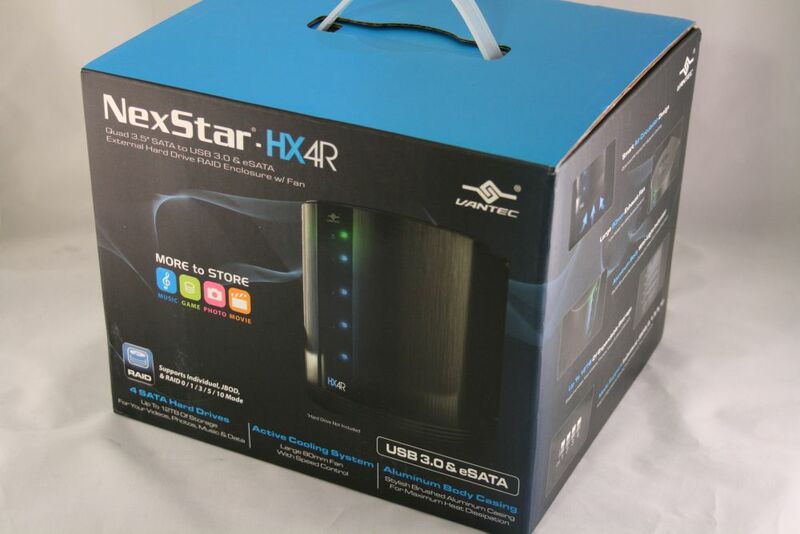 Results should go up considerably, and they do, reaching an average of 130 MB/s on USB3 and 125 MB/s on eSATA. Normally one can see better scaling than this when using SATA based controllers. I did try that and found that my results were a bit better coming in at 165 MB/s. 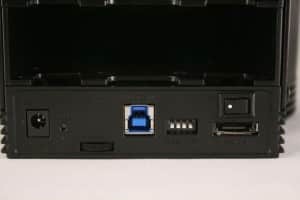 There seems to be a small difference in eSATA and USB3 note, but not something I would be particularly worried about personally. So, for giggles, I decided to drop in an SSD and see how the unit did with a drive in it that was more taxing than the four drives I used for the review. I dropped my OCZ Agility 3 in there to see what happened. The first thing to note is you will need 3.5″ to 2.5″ adapter in order to get a drive of that size in there properly (not included). Next up I tried the drive on both eSATA and USB3 connections to see if there was a difference. There really wasn’t anything noticeable at all. 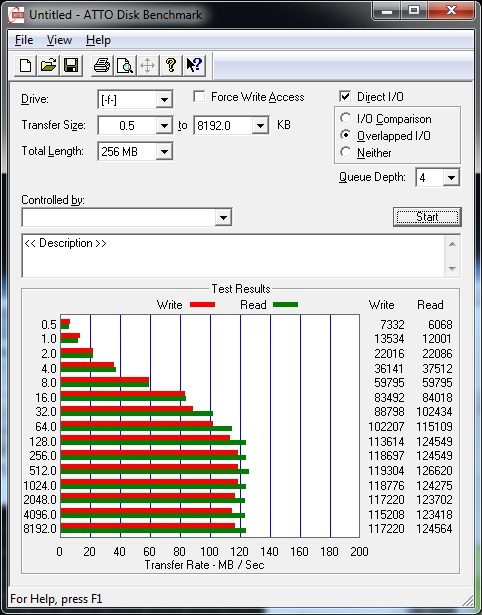 What you will note with the results below are that it is A LOT slower than if in a regular SATA2/3 port. I have to think since these results were consistent between both eSATA and USB3 that the backplane/port multiplier they are using is based off SATA1 speeds or has some other bottleneck. What does this mean for you? Not too much really. Outside of the fastest drives on the market (think Velociraptors), most drives are not hitting these speeds so there isn’t too big of a need to worry. Just don’t use modern SSD’s in it. 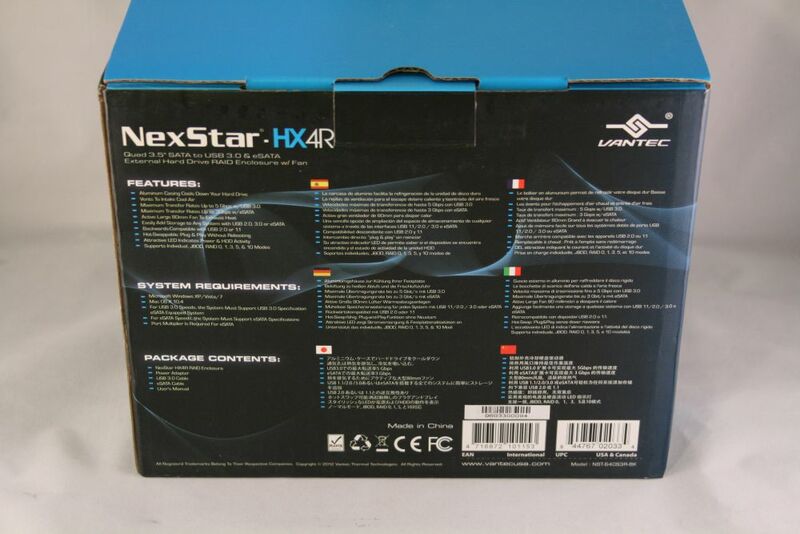 To start off, the pricing on the Vantec NexStar HX4R comes in at $129.99 at Newegg.com. Which seems to be good from my searching around of similar devices. The good here is that, for my tastes, it looks good. The black brushed aluminum chassis with LED displays on the front ensure it can blend in with most any setup and not stick out like a sore thumb. 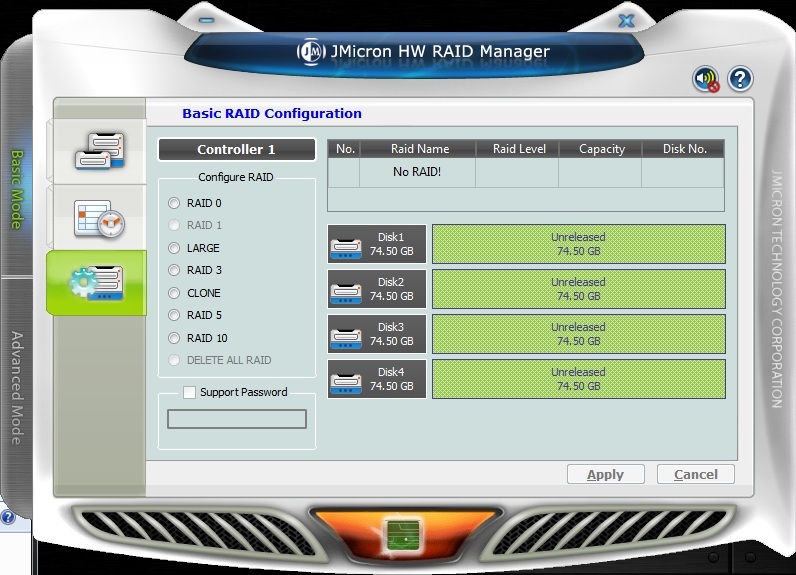 The ability of the enclosure to do several RAID types is a plus (though similar items can do that too) both with software, and with a jumper configuration. 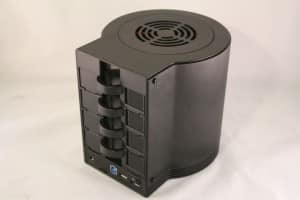 The 80 mm fan helps keep the drives cool by taking in cool air from the bottom, up through the drives, and exhausting the warm air out the top, and does so with barely a whisper. 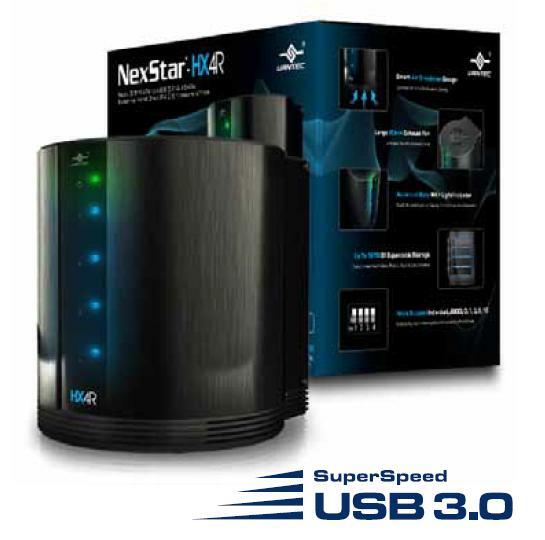 You have connectivity flexibility as well with utilizing a modern, quick USB3 interface or eSATA. 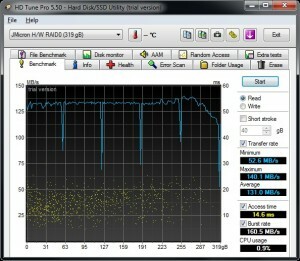 Even the fastest of drives will not saturate the USB3 interface. 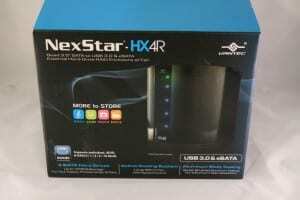 About the only bad thing I can say is that I would have liked to have seen a faster backplane/port multiplier on it in case someone wanted to drop some SSD’s in it, but that is a very expensive proposition for a user and quite frankly, the HX4R isn’t made for that in the first place. However, if you want to drop in a Velociraptor, or anything that gets over 150 MB/s on average, you may be a bit limited. Being that this item is really out of our wheelhouse of expertise, I’m not going to ‘approve’ this enclosure officially. I just do not have enough data sets from its peers to make an accurate assessment. That said, at the $129.99 price at Newegg, I think you get a good deal for such a device. Check around, but make sure this one is on your list for sure! 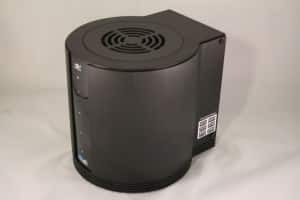 This was actually on my short list before deciding to go with a full on NAS instead of a simple enclosure. From the other reviews I looked at your results are about on par with there conclusions.